Crosses for First Communion, Confirmation and Graduation! With the beginning of a New Year, there are many special events coming up in the life of your students. 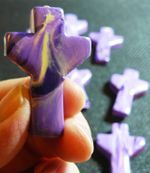 Deb's wonderful handcrafted crosses have become a cherished gift in schools across North America. Made of vibrant polymer clay, no two are alike. Made of durable and vibrant polymer clay each Cross is as unique as a snowflake. Lightweight and sealed with a glossy finish, each cross comes ready to be popped onto a cord, ribbon or chain. While they retail for as much as $20 per cross, we offer them to schools at a huge discount of just $5 per cross when you order a minimum of 25 pcs. These one-of-a-kind crosses are backed by a Prayer Card and packed in a clear cello envelope. They are available in blue tones, earth tones, rainbow tones, and purple tones. Necklace cords can be added for a nominal charge. And, we always pay the tax. Any number of crosses over 25 pieces may be ordered to receive the wholesale price. Call Deborah at 905-468-9502 to arrange over the phone with a credit card, or we can send an invoice via Square. We also accept electronic money transfers, purchase orders, and cheques. There is an additional fee for shipping. Taxes are covered and everything is in Canadian dollars. You can also at holyangels@sympatico.ca to tell Deb the occasion and the colour of crosses your school wishes to order. Orders are individually created and turnaround time is about 10 days. Items are shipped via Canada Post Expresspost. Please note that we are a small business and expect that payments are made at the time of placing the order, if possible. Guardian Angel Charms - Everyone loves an angel! The gift of a Guardian Angel is always appreciated. Special price of $4.50 each with a minimum order of 25 pieces. Comes with lariat, backed by a lovely card in a sealed cello envelope. Our wonderful crosses have been gifted to students making their First Communion or Confirmation, and for those who are graduating. They make meaningful gifts of faith at Christmas, Lent and Easter. Many principals keep a stock in their desks for tokens of thanks. These one-of-a-kind crosses are backed by a Prayer Card and packed in a clear cello envelope. Handcrafted crosses by Deborah, they are available in blue tones, earth tones, rainbow tones, and burgundy tones. The crosses are $5 each with a minimum order of 25 pieces. Any number of crosses over 25 pieces may be ordered to receive the wholesale price. Call Deborah at 905-468-9502 to arrange over the phone. Or email at holyangels@sympatico.ca to tell Deb the occasion and the colour of crosses your school wishes to order. Made of durable and vibrant polymer clay each Cross is as unique as a snowflake. Lightweight and sealed with a glossy finish, each cross comes ready to be popped onto a cord, ribbon or chain. Measuring just over an inch in height, each cross comes on a card with a beautiful prayer. Beautiful black silk cords can be included for a nominal fee. Each cross is energized and blessed with the intention that the recipient may be fully embraced by Divine Love and have a greater awareness of the grace of God working in their life. Because each one is absolutely unique, you may well see images that are naturally created by the swirl of colour, a little wink from God. You'll notice something a little different about the shape of this Cross. After much prayer and reflection, this is the image that came to Deborah - the crossbars echoing the shape of hands uplifted in surrender and raised in praise. Its unique design is a visible reminder that we are always transformed by Love. A sacred symbol of Love that will not let us go! For Payment Options, please scroll down to the bottom. 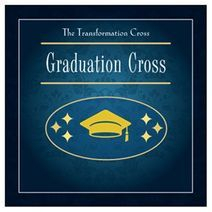 Transformation Crosses for First Communion, Graduation, Staff and Volunteer gifts, Fundraisers and more! 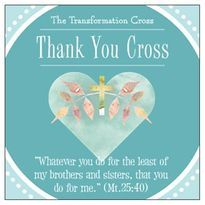 Schools and organizations across North America have expressed appreciation and delight for their crosses. 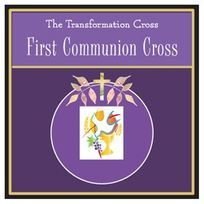 Year after year, we receive orders from satisfied principals, teachers and committee heads for crosses to enhance graduation ceremonies, first communion Masses, special occasions and unique gifts to offer as tokens of thanks. At the low cost of $5 each, these one-of-a-kind crosses are an affordable gift that won't break the budget. And we pay the tax! We can also make a custom prayer card for your school. 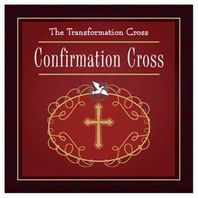 Transformation Crosses also make an excellent fundraiser for individual class endeavors or for the school as a whole. We can discuss a prayer card to accompany the crosses that will be meaningful and affirming for all involved in your fundraiser. A Special Time Limited Offer! Larger quantity details are listed below, but if you'd like to sample the Transformation Cross, we are offering 10 crosses, in your choice of colors, for only $50 (half the retail price)! Choice of Brown, White, Rainbow, Burgundy, Purple tones or Madonna Blue. Call us at 905-468-9502 to place your order with a VISA, Mastercard. You can also order with an email money transfer or online with Paypal below. You can order as many crosses as you like over the 25 minimum to get the discount. You can also mix and match colours as part of the same order. For example, you may want 20 graduation crosses in blue and 30 volunteer thank you crosses in rainbow. Just give Deborah a call to set it in motion. Call 905-468-9502 to place your order with a credit card. We also accept electronic money transfers, cheques and money orders. Please note that we are a small business and we prefer that payments are made at the time of placing the order if possible. There is an additional fee for shipping. Taxes are covered and everything is in Canadian dollars. We give thanks these and the many other schools who have supported our ministry over the years! We are blessed by you.